Sufi paraphenelia: Majmua and Firdows attars, along with a musk rose incense stick and a “Tasbeeh” rosary. If Sufism were to be likened to a perfume, its top notes would be peace, freedom, compassion, humility, unity; heart notes of purity, universal equality, devotion, sincerity and wisdom; and a sublime base note of unconditional love! 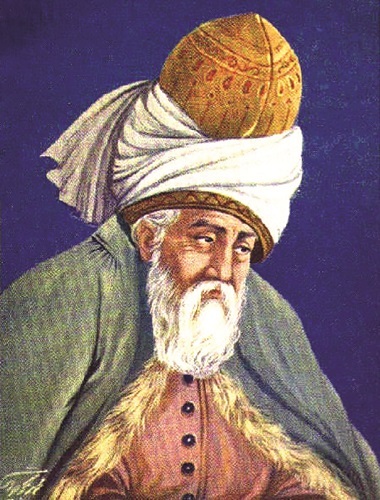 Known to be the core essence of all faiths, Sufism, emerges from the essence of Islamic spiritual teaching. It follows the path of all-encompassing love and its core principles, including compassion and brotherhood. Legendary Sufis like Ibn el Arabi of Andalusia even propounded the theory of ‘Wahdat al Wujood’ (unity of mankind) and ‘Wahdat ad Deen’ (unity of all faiths) emphasizing that these principles lay at their very core, uniting them spiritually. Since fragrance has a direct relation with the spirit, Sufis consider it to be an expression of spirituality and spiritual inspiration. Sufi mystics consider the universe’s bounties as manifestations of divine beauty and signs of the universal creator, among whose most sublime creations is fragrance. Known to exhilarate and spiritually elevate mankind since ages, the Sufis are no exception to loving fragrance which has been unanimously viewed by them in many enlightening and intriguing ways. Beginning with Islam, non-alcoholic perfume concentrates or ‘attar’ have been a part of ‘Sunnah’ or prophetic tradition including the practice of burning agarwood (oud) chips in the form of ‘bakhoor’ or incense on ornate Arabic incense burners called ‘Mabkharah.’ Since alcohol is ‘haram’ (forbidden) in Islam, attars have been a part of all Islamic communities and even Sufi orders. Rumi in his greatest work , the ‘Masnavi’, also talks of the Qur’anic story about how the visually impaired Prophet Jacob, while in Egypt, could feel the scent of his son Joseph (Yusuf) from miles away as his caravan left Canaan. When Joseph cast his robe on his father’s face, he began to see again. Rumi says “buye pirhaan e yusuf kon sanad. Zaan ke buyesh chashm roshan mikonad” (“Make the scent of Joseph’s robe your rope. Hold on to it, for it gives sight to the eyes”). Here, Rumi talks about sensing the ‘scent’ of God’s presence so our spiritual eyes maybe opened. Fragrance finds significance in various Sufi practices. “The ‘Whirling Dervishes’ of Rumi’s ‘Mevlevi’ Turkish Sufi tradition burn a musky-amber and oud incense (tütsü) and even wear a unique daffodil and rose fragrance during the legendary ‘Sema’ ceremony. The scent of Narcissus signifies God’s love,” says Handan Is¸ık, a passionate lover of Sufism from Konya, Turkey, where stands Rumi’s mausoleum, a place of pilgrimage for her kind. In parts of the Arab world where ‘dhikr’ (remembrance of God) ceremonies are performed at Sufi gatherings like ‘Hadrah’, bakhoor is burnt to not only purify the atmosphere, but to create the spiritual mood. Attars of different types are worn by the ‘mureeds’ or Sufi disciples and even the ‘Sheikh’ or the master who presides over the ceremony. In India, there is the tradition of smearing attar on ‘chaadar’ (sacred cloth sheets) which cover the graves of Sufi saints at mausoleums. Perfumer Praful Gundhi explains that while his two classic attars ‘Majmua,’ a unique rose and kewda (pandanus) blend, and ‘Firdows,’ a warm, fresh green aromatic attar are generally preferred for ‘Dargah’ or Sufi mausoleums, some also use black musk, rose and jasmine. Incense sticks, or ‘agarbatti’ also finds a place in Indian Sufism. “Devotees often buy my musk rose incense and have the dargah priest pray over it. They feel the pure spiritual energy after they light it thereafter,” he explains. ‘Loban,’ a resin, is also burnt with charcoal on special burners. The individual, with head covered, walks around the mausoleum with the burner so the smoke spreads evenly throughout, dispelling all negative energy and inspiring devotion. Fragrance plays a role in not only beautifying Sufi practice but also by providing spiritual inspiration through its myriad avatars. Like music, good food and natural beauty, fragrance can be called “ni’amah” Arabic for “divine grace,” that liberates man from the ego’s trappings. Sufim’s insight into fragrance makes us feel that there are after all, a few drops of its mystical wisdom in each great fragrance of the world in the form of those secret notes that become the soul’s elixir! The liberating ‘aha’ that fragrances of various kinds cause their lovers and wearers to experience can be called ‘split-second Sufism!’ It is when the soul suddenly feels the deep connect with its source for those few moments of nosing the opening notes, or even throughout the course of the fragrance’s unfolding from the top to the heart to the base, like a mystic ceremony of divine love!